Cruise the Bahamas andCaribbean onboard the well-appointed yacht AQUA LIFE! 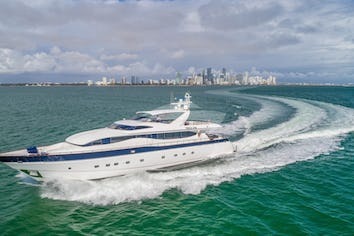 She boasts a meticulously maintained interior that accommodates eight guests in four luxury staterooms.Guests will enjoy lounging with family and friends in the stylish saloon or enjoying the amazing views and sunsets on the spacious flybridge. 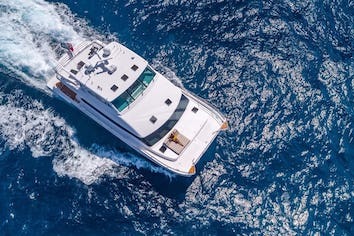 AQUALIFE offers a wide assortment of amenities and water toys; whether you are looking for a relaxing getaway or a charter filled with adventure and fun, AQUALIFE is the yacht for you! Let her experienced crew show you the best of theBahamas and Caribbean! The Regulator 36 is built tough with twin Yamaha F300C outboard engines, plus a saltwater wash down, live well plumbing, insulated forward fish boxes, in-deck illuminated locking rod storage and a 40-gallon freshwater system with wash down and cockpit shower. Seats up to 12 riders. Keep in mind we can always add to this itinerary or remove items. It is designed to be flexible for weather issues and client wants/needs. We can change times to suit your preferred meal times and other factors. Please let us know what you would like changed. -8:15am depart Aqua Life for Dive check in with Brendals dive center make sure everyone has dive cert cards. -9:30-2:30 -2 tank dive, Crew will send you with lunches and snacks, water provided by Brendals as well as cooler space for choice of beverages from Aqua Life. -4:15pm Head to Pig Beach to feed the pigs great for photos and then swoop around the island to swim with the sting rays and turtles! -Enjoy the toys and sunshine at anchor (paddle boards, Lilly pad, jet skis, wakeboard etc) or go to Man-o-War to shop the town's famous hand bags at the Sail Shop, bags are made from recycled boat sails, canvas and other fabrics for durable fun and unique souvenirs . -7:00pm Sunset Picnic Dinner on the Bow (for smaller parties) or Dinner on the aft deck for a full boat. - Option to fish or go Tubbing and Wake boarding depending on your preference. -Picnic Lunch on Tahiti beach followed by happy hour at Cracker Pees..
-9:00pm- Karaoke Night on board with our extensive library and your DJ for the Night CAPPY AND CREW! RYA Offshore license & now 200 gross ton license and Portuguese yacht license unlimited. Captain Tiago Palma was born in Lisbon, Portugal. Tiago started sailing at only 6 years old. 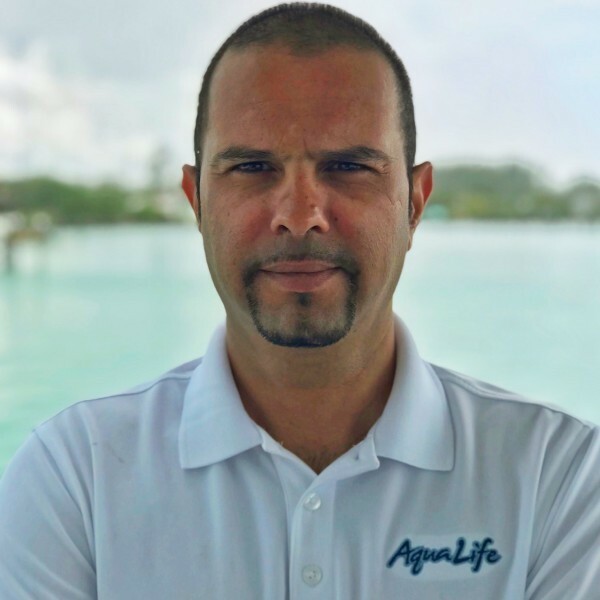 He studied Oceanography and has extensive experience sailing, diving, windsurfing and sport fishing in some of the best locations around the world with 3 Granders caught. In the summer of 1996, he joined the yachting industry in Portugal as a deckhand and after two years became a Captain. Tiago has vast charter cruising experience ranging from the Caribbean, to the Mediterranean, the Pacific waters off Costa Rica, Panama and even the remote waters off west and east Africa. Tiago is a consummate mariner providing his guests with a safe and memorable experience. In his spare time Tiago’s passions are photography, diving, fishing and traveling the world. Born in Miami, FL with a Cuban / Colombian background Chef Bryan Rivas deep appreciation for cuisine was developed at a young age. Graduate of Cordon Bleu, Miami for culinary arts, Chef Rivas specializes in bold flavor forward dishes, across a broad range of domestic and international cuisines. As well as catering to clients with dietary preferences. With an extensive background in the field, from working in 5 star restaurants and hotels to being a personal chef, Chef Rivas is extremely passionate about providing exceptional hospitality and world class cuisine. Chef Rivas now has been in Yachting for the past five years, where he prepares delicious full course meals for clients on board. Traveling to different countries like Chile, Japan, Peru, Bahamas, Mexico, Chef Rivas implements diversity into his dishes. He has won several awards such as The Peruvian food festival, and the central Florida James award. He is a perfectionist with a good eye for quality, taste and perfection. We know you're going to want to eat out a few times at local restaurants and we can discuss which days you'd like to do this when you arrive and what works with your schedule. Avocado and Poached Egg Caprese- This is poached eggs on a bed of avocado and wheat toast topped with sautéed onions and tomatoes with a drizzle of Balsamic glaze. Our owners love this healthy breakfast that gets them ready for the day. Continental style breakfast- We typically set up toast, waffles, muffins and bagels with a selection of jellies and jams and cream cheese and honey. Bowls of Yogurt and granola and dishes of fresh fruit and a dish of boiled eggs. We can add more items to this, it is just our basic continental layout. Fish and grits or shrimp and grits- Whenever our guests catch fish we love to cook their fresh catch and this is a great hearty breakfast to prepare you for a day of activities. If the weather wont allow fishing we have frozen grouper and shrimp as back up. Cheesy grits topped with fish or shrimp and a savory taso gravy. I can also add fried eggs to this if you'd like as I know many clients enjoy breaking a creamy egg yolk over their grits and gravy. Mascarpone Stuffed French toast- Thick slices of fresh baked bread made into decadent french toast stuffed with cinnamon sugar mascarpone and fresh fruit drizzled with maple syrup. California Turkey club wraps- Savory tuscan turkey breast wrapped up with chipotle mayo avocado lettuce bacon and provolone cheese. This is a great option for a beach picnic when paired with a fruit salad and Matt's famous Redneck Caviar. A dip/salad loaded with Black beans, shoe peg corn, onion and jalapeno. Buffalo chicken pinwheels- These are a mild buffalo marinated chicken salad with cheddar cheese wrapped up into pinwheels with flour tortillas. I love to serve these with salsa, queso and a vegetable platter with ranch or blue cheese dressing. Philly cheese cake sliders- Seared thin sliced deli beef with onions, peppers and mushrooms topped with provolone cheese and baked to goey, savory goodness. Paired with a variety of chips to pull from and a big green salad. Honey mustard chicken bacon salad- A delicious main dish salad with an unbeatable combination of grilled honey mustard chicken, smoky bacon, creamy avocado, juicy tomatoes and spicy red onions on a bed of fresh crisp greens. Roasted Pear Salad- Arugula topped with dried cranberries, blue cheese and walnuts stuffed inside a roasted pear with a lemon and honey dressing. A refreshing lunch for your sun filled days. Pesto Pork Tenderloin- Fresh pork tenderloin with a pesto rub marinated to tender deliciousness paired with pepper couscous and a 3 greens casserole. Individual ramekins of 3 savory greens in a béchamel sauce topped with crispy toasted panko. Jamaican curry shrimp- A Caribbean favorite! Shrimp sautéed in a sweet and savory yellow curry over a bed of rice finished with a sprinkle of fresh herbs. Mini Beef Wellington- Beef Wellington is a preparation of filet steak coated with pâté and duxelles, which is then wrapped in puff pastry and baked. Topped with al dente asparagus and manchego roasted cauliflower. Beer braised pulled pork- A Guinness International braised pork shredded with a delectable tangy barbecue sauce. Served with a vegetable fritter, carrots and zucchini packed into a patty and toasted with a tzatziki drizzle and sautéed green beans. Cashew Crusted Fish- You catch it we cook it! Your catch crusted and baked with coconut and cashews served with local style rice and peas alongside a delicious brussel sprout mushroom and balsamic casserole. Caribbean Surf and Turf - Split lobter tail with red curry steak and jasmine rice, served alongside pork and red cabbage spring rolls and and asian Slaw. Hibiscus tea lemon bars -a wonderful twist on everybody's favorite lemon dessert! Pineapple Upside down cakes served warm with vanilla bean ice cream and caramel. We had an amazing week on Aqua Life. The yacht is in great condition and is perfectly appointed. My wife and I and our boys (ages 12, 15 and 17) can't stop talking about how it was the best vacation ever! It was great to have the tender for exploring, fishing and snorkeling and we loved using the waverunners to cruise around and wakeboard. When we weren't on the water, we were spending great family time on the flybridge or in the saloon listening to music, playing cards or monopoly, or watching amazing sunsets! The crew was outstanding. Captain Tiago knew all of the right spots to take us to all around the Abacos and made every excursion a fun adventure. Claudia is the sweetest and made sure that we were always comfortable when we were on the yacht and all of our needs were met. She was great with our boys and we all lover her. One of the highlights of our week was Karaoke night with the crew. We all let loose a little and were laughing all night. The entire crew were always present but never smothering. They are definitely very experienced and knew exactly how to maximize our enjoyment on and off board. 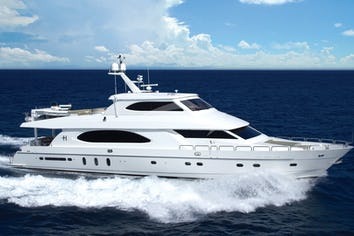 I'd highly recommend Aqua Life and can't wait to book our next charter on it! I wanted to reach out to you and extend my family's sincerest appreciation for the exceptional service we received during our vacation! You picked the perfect boat - Aqua Life - with a great crew! My family and I had an amazing experience where we wanted for nothing and could simply relax and unwind as a family! I look forward to future charters with you and would not hesitate to recommend you based on our recent experience. Considering the myriad of adjustments that were made just prior to the start of our trip you made it happen with no problems encountered. Again, Thank you for a great, worry free adventure! 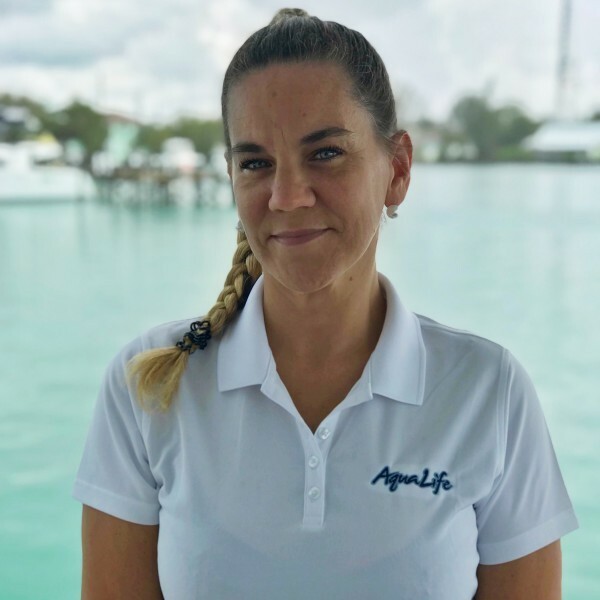 Re: Charter Trip on the "Aqua Life"
My wife and I wanted to thank you for all of your assistance in scheduling our most recent trip to the Abaco Island aboard the AQUA LIFE yacht. It definitely was a memorable trip, and the crew was most accommodating in planning an itinerary tailored to our likes/dislikes all the way to the islands we preferred to visit. The Captain and crew were extremely professional, attentive and always available to assist us. And I cannot say enough about the quality and taste of each meal prepared specifically for us. The food was spectacular! The entire trip from the scheduling of the charter to the fine service provided by the crew and meals were extremely impressive, which would encourage us to plan trips in the future. We look forward to future charters with you!